More Floods: "Projected adverse impacts based on models include . . . a widespread increase in the risk of flooding for human settlements (tens of millions of inhabitants in settlements studied) from both increased heavy precipitation events and sea level rise." Increased spread of infectious diseases: "an increase in the number of people exposed to vector borne diseases (e.g. cholera) and an increase in heat stress mortality." Degraded water quality: "Projected climate change will tend to degrade water quality through higher water temperatures and increased pollutant load from runoff and overflows of waste facilities." More frequent and more intense heat waves, droughts, and tropical cyclones: "The vulnerability of human societies and natural systems to climate extremes is demonstrated by the damage, hardship, and death caused by events such as droughts, floods, heat waves, avalanches, and storms." 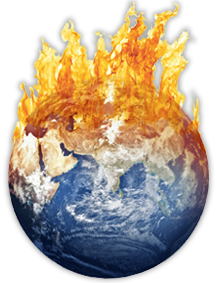 global mean temperature should increase by between 1.4 and 5.8�C (2.5 to 10�F). the Northern Hemisphere cover should decrease further, but the Antarctic ice sheet should increase. the sea level should rise by between 9 and 88 cm (3.5" to 35"). other changes should occur, including an increase in some extreme weather events.